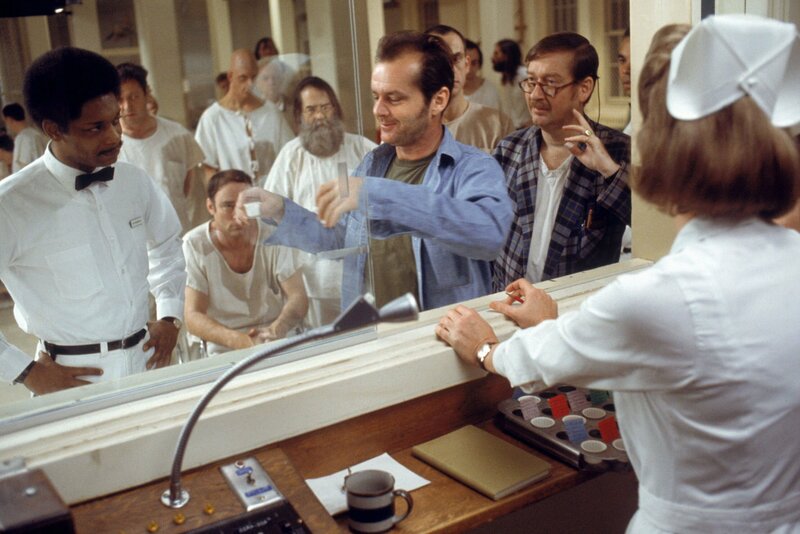 My Halloween theme this year is One Flew Over the Cuckoo’s Nest. So I started to make my props already. One of the props I started with is the PA system. I made this prop from this photo. It’s not a complete view of the PA system, so I had to make some stuff up. My Halloween theme this year was Bride of Frankenstein. I’ve been working on this theme all year, so it was great to see it finally come to life. Many of my props I’ve been posting over the past week, but there were plenty of decorations as well like the Mad Scientist Lab Combo and the Frankenstein and Bride of Frankenstein wall decals. My costume I made following the Little Miss Monstrous Costume pin on Pinterest and I also tried another pin to erase my eyebrows. I’m not great at makeup, but overall I think my makeup came out pretty decent. Also, my friend did the eyebrows because I knew I would mess those up. For the costume, I followed the directions for the drape and arm wraps. The wig, I crocheted. I also made some gloves to cover my hands as well. If I were to do it all over again, I would not have used ace bandages for the arms wraps. They were not comfortable and kept slipping all day. I think I’d probably just make wraps from rags. Perhaps using a cheap bed sheet? But I do love the final costume. This pin has also been re-pined from my board probably at least a hundred times by now. I hope there were a lot of Brides of Frankenstein out there this year. And yes, this costume is much better and more authentic than the one I saw at Target. So, my cubicle won 1st place at work and my costume won 3rd place. I’m very happy with my results. And I have at least two more Halloween ideas in my head to keep me going for the next couple of years, although it would be pretty difficult (and expensive) to top this one. Part 4 in the Frankenstein’s Laboratory prop series, leading up to Halloween. These next props were some quick easy props I put together for Frankenstein’s Lab. One of them was inspired from pictures of the movie set. The other one is just a map scientist prop made from excess parts. I found all of these supplies at craft stores. Paint the half ball and small ball black. I did two coats. Paint one of the rods white (two coats as well). I traced the rod circumference onto the half ball and onto the small ball. I cut the rod circumference out through the half circle and I cut out the circumference into the small ball a couple of inches. This one I just kind of threw together with some excess pieces of the other props and some other pieces I bought and never used. Spray paint the Styrofoam balls, dowels, and kebab sticks metallic silver. Trace the Styrofoam block onto poster board and cut out. Paint the glue the poster board onto the Styrofoam cube. Paint the cube black (2 coats). Glue the one gauge onto the cube. Cut the wood dowels and hot glue into the knobs so that about 2″ of dowel sticks out. (See the first post in this series for more). Stick the radio knobs into the Styrofoam of the Styrofoam block. Stick the silver painted dowel into the large silver Styrofoam ball and stick into the top of of the Styrofoam block. Wrap the silver wire around a cylindrical object t form the shape. I used one of the Styrofoam rods from the above prop. Cut the silver wire in half. Stick the silver kebab stick into the small silver painted Styrofoam ball, place through half of the coiled silver wire, and stick the other end into the top of the Styrofoam block, at an angle. Do this for both. Expand the coiled silver wire to the length between the ball and the block. Glue the gauge image onto the Styrofoam block. Roll out some putty to form a frame around the gauge. Take a second hand from a clock hands kit and stick into the Styrofoam to be the gauge needle. Part 3 in the Frankenstein’s Laboratory prop series, leading up to Halloween. The next prop for Frankenstein’s Lab was also inspired from pictures of the movie set. I think this is a large Jacob’s ladder, perhaps? Most of these supplies were purchased at craft stores and the light wire was purchased from Amazon. I traced the gold metallic rings on the poster board, with a larger ring and then the next size down. I cut out these circular disks from the poster board. I taped the poster board to the gold metal ring using the duct tape, then I wrapped the entire disk with the gold metallic duct tape. I spray painted the large wire wreath frame with the metallic gold paint. I made four gold disks total, not counting the wire wreath frame. I then cut out 12 – 8″ circles from poster board or heavy stock, 24 – 6″ circles, 24 – 4″ circles, and 24 – 2″ circles. I spray painted the paper circles on both sides with the gold metallic paint and punched small holes in the center of each. I punched three holes around each of the gold disks, trying to keep them in line with each other. I started with the smallest gold disk and tied the gold string through one of the holes in the disk. then gold bead and knotted. I did this two more times for this gold disk on the other two holes. Then I took each of the three strings and ties them to the next sized gold disk up in size. As I continued up through the gold disks, I increased the length of the gold string, but in general I tries to keep the circle/bead series in the center of the gold string between the gold disks. I took the flower pot and spray painted it inside and out with the gold metallic paint. I tapped the bottom disk to the flower pot. I took the strobbing wire and tied it up through the inside of the prop. This prop took me about a month to make over the summer. This was definitely the most time consuming of all the props I made. The strobbing wire through the inside of the prop. Part 2 in the Frankenstein’s Laboratory prop series, leading up to Halloween. The next prop for Frankenstein’s Lab was inspired from pictures of the movie set. I don’t know what this prop is called, but it is a piece of high voltage electrical equipment. I purchased the nested bowls on Amazon and the rest of the supplies came from a local craft store. I painted the Styrofoam ball and plastic bowls inside and out with the metallic silver paint. I drilled holes in the center of each bowl. I strung the silver string through each bowl and triple knotted the string under each bowl. I knotted the string under the Styrofoam ball and used half a paperclip to pin down the rest of the silver string to the Styrofoam ball. The assembly of this prop was quick, but I did a few coats of paint on the bowls inside and out, so they require drying time.